Is AI (Artificial Intelligence) akin to The Emperor’s New Clothes? In that Hans Christian Andersen tale, two weavers promise an emperor a new suit of clothes that they claim is invisible to people who are unfit for their position. When the emperor parades before his subjects in his new clothes, no one dares to say that they do not see the clothes for fear that they will be seen as “unfit for their positions, stupid, or incompetent.” Finally, a child cries out, “But he isn’t wearing anything at all!” My insightful client’s request for an Artificial Intelligence for Dummies book made the point that it feels just like the 90s, when there were spectacular stories of technology and a threatening sense of the consequences of not understanding it. And with AI, we might very well end up in the same place we did then, with technology maturing, many promises made, and many broken. Only a few new, large-scale enterprises grew as a result of the investments and emerging technology of the 90s—and this pattern has repeated itself throughout history. Technology, investment, and brave leadership have all reshaped the future during periods when both promises and dreams were broken. The third horizon (H3) is sometimes characterized as “moon shots” or “skunk works.” This is a much more explorative approach to creating future S curves that will be commercialized in H2 and end up producing significant cash flows in H1. Now to artificial intelligence. Ask yourself: on which horizon does AI belong, and how should you approach and use it? Keep in mind that the increase of patent applications and investments in artificial intelligence in the United States and China is tremendous: there are 28,000 filed patents, 35,000 AI companies, and over $20B in investments from 2016 alone, which are forecast to boost global GDP by $16T (The Economist, 2017). The most likely reason behind the growing interest in AI is the growing computing power and new computer architecture that can perform vector operations (an important component of AI) much better than traditional computer architectures. It’s not going out on a limb to say that totally new computer architecture and algorithms will take AI even further in the future. And it doesn’t take a crystal ball to know that you will benefit from getting ready for a future where more than 50 percent of today’s jobs have been replaced, Universal Basic Income is introduced, self-aware robots have entered the market, and a totally new market logic is established. You want artificial intelligence and technology to help you grow your revenue in total, increase the number of customers you serve, or increase the price or value of your offering. You want artificial intelligence and technology to help you reduce costs and increase efficiency. You want artificial intelligence and technology to help you solve particular regulatory or other compliance problems in your organization. You want to be a more socially responsible and ethical organization, serve the community, decrease negative externalities like pollution, or treat your employees better, e.g., by paying them a living wage. Nobody is predicting a slower pace for development and innovation diffusion of AI, robotics, big data, and other disruptive technology. Nobody is predicting a more stable situation: the world’s population is growing, global challenges are increasing, and the political situation around the world is driving de-stabilization even more. Preparing a clear strategy for AI-driven technology innovation is probably the most imperative initiative that all C-suites can pursue, both today and for the coming years. Without a clear strategy you cannot make the right decisions about managing today’s business in the first horizon, much less the second and third. Follow these seven steps to set a strategy for Artificial Intelligence and other disruptive technologies. Decide on the rationale—the “Why” question. Identify relevant external drivers: Political, Economic, Social, Technological, Legal, Environmental, and Demographic factors that will influence your organization’s ability to defend and expand market possibilities. Analyze your organization’s need, based on these key external drivers. Assess and measure your organization’s readiness with respect to leadership, capabilities, and competencies for radical innovation. Link need and the organization’s readiness in leadership, culture, capabilities, and competencies. Define clear KPIs for monitoring and managing the degree of readiness. Set additional clear KPIs for monitoring and managing your innovation portfolio (from the first to the third horizon). Link the needs of today (H1), tomorrow (H2), and the further time horizon (H3). Align with IT strategies, corporate strategies, HR strategies, and marketing strategies. With Innovation360, your organization can learn from our experience with AI recommendation engines, AI Strategy projects and a number of implementations. 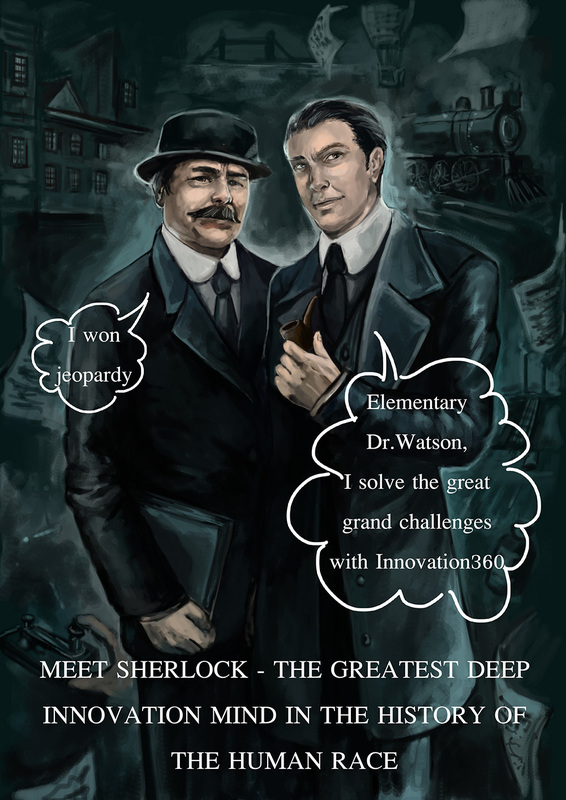 In addition, we can introduce you to Sherlock, the world’s first AI program designed exclusively to find patterns and spot trends within accumulated innovation data. Don’t take chances with the continuity of your business. Start to learn, experiment and set an AI strategy already today.